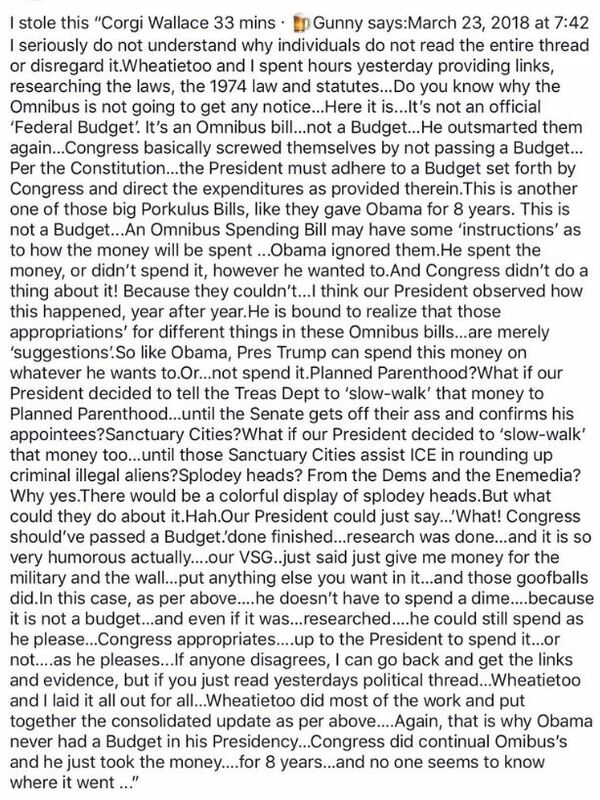 I thought I’d let things die down a bit with respect to the recently passed and signed into law Omnibus Appropriations Act before I commented on anything. I’ll admit right up front that I’m not a lawyer. However, I am able to research things and use critical thinking skills to determine what might not only sound plausible, but actually be reality. Of course, people will disagree over the issue of the Omnibus just as they disagree over the second amendment (2A), or first amendment (1A). Discussions or even debates can be had and arguments applied. In the end, each person will have to decide which rationale seems best and hopefully, they will base their opinions and views not on how they feel about something, but upon actual facts. Regarding the Omnibus Appropriations Act that President Trump signed into law, we need to remind ourselves that it’s only good for six months. It will take us to the September and then Congress will have to go through this process again in order to keep the government running. What is interesting about this timetable is the fact that September is just shortly before midterm elections happen this November. If things don’t play out favorably for the Democrats, they will be replaced. Honestly, I am not privy to all the political games being played in DC. In fact, I hate game-playing at all, so I would undoubtedly not make a good politician because it seems that in order to accomplish anything as a politician, you must be willing to dicker back and forth, give something to get something; you scratch my back and I’ll scratch yours, etc. The idea that a person can simply be true to the character is exceedingly rare in a politician and that truth has been understood since before the days of Samuel Longhorn Clemons (Mark Twain). The upshot of the Omnibus Bill is that funds have been made available for the wall on America’s southern border. Did Trump receive all the money needed? Not from the look of it…or did he? There’s obviously some disagreement over this with people weighing in on both sides. I’ll quote from a few of them. There appears more at play here than just the amounts listed in the bill itself. Some argue that this bill is not really a budget. Others argue that it’s a summary of numerous federal budgets. I don’t know. After researching things, it seems reasonable that maybe there is some difference between a budget and a bill. We all know that during Obama’s presidency, Congress never gave him a Constitutionally balanced BUDGET. They instead gave him Omnibus bills and we saw that he essentially did whatever he wanted to do with the monies allotted by Congress. Was it legal for him to do so? Again, I’m not sure. I am confident that if it was legal for Obama to have done that, if Trump did the same thing, neither the Left nor the MSM would let it go and groups would likely sue Trump because of it. Former Attorney General Eric Holder, the guy who was held in contempt of Congress and is on retainer by the state of California, has threatened to sue President Trump for deigning to put the question of citizenship back on the census form in 2020, even though there is nothing wrong with asking people as part of the census if they are American citizens. So we know that the Left will sue for any reason. 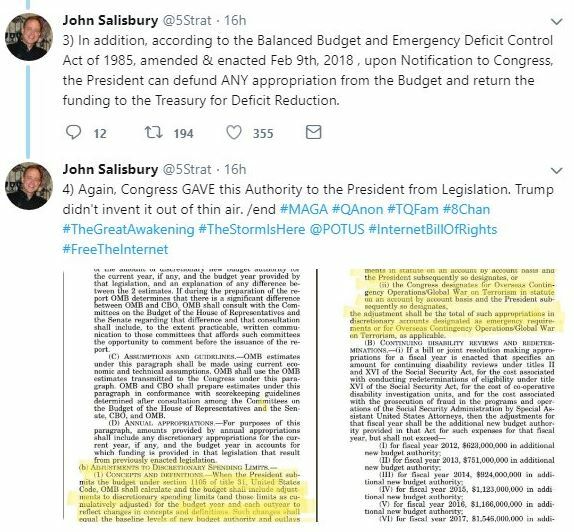 There are some on social media who believe that because of the law, Congress in the Act pursuant to section 251(b)(2)(A) of the Balanced Budget and Emergency Deficit Control Act of 1985, the president has powers to use money allocated by Congress on the war on terror and it also ties into his executive order from this past December where he declared a national emergency with respect to the opioid crisis. What does this mean? It seems to mean he can then take the $145 million from the Omnibus and move it to the national health emergency regarding opioids. What does this mean? Since it is very clear and indisputable that much of the illicit drugs in America come into this country from outside, the president has the authority to do whatever he can to keep drugs out including building a wall for such purposes. 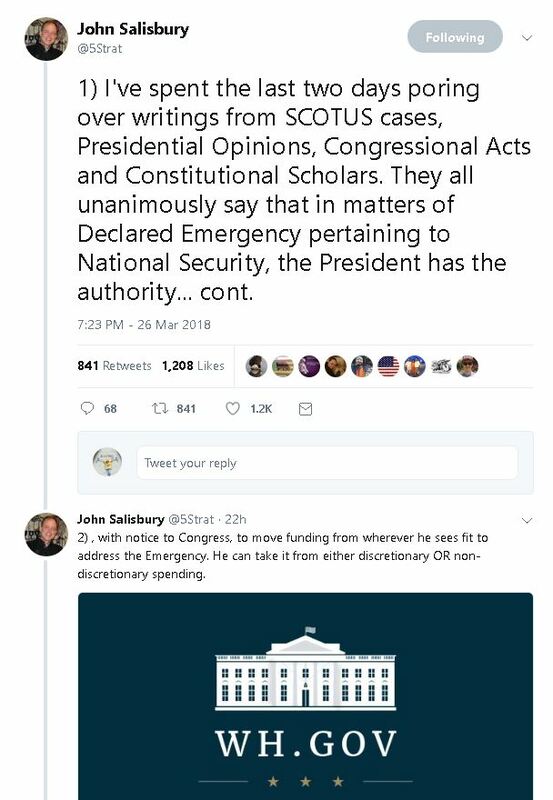 There are many people who believe (and have done the research), that President Trump will have the necessary money to build the wall and it looks as though it’s moving ahead. Honestly, I’m hoping because our country needs something to help keep people from pouring in illegally as they’ve been doing for decades. The cost to budgets and lives of Americans is beyond the pale. If we could close off that open border, this country would save a great deal in terms of money and agony. We need to deal with America’s homeless problem and the many problems facing America’s veterans before we start picking up the tab for people who are illegally here. It is unconscionable to me that there are folks in America who think that anyone who illegally walks into the USA should be given “benefits” that we do not even provide for true American citizens. Of course, time will tell regarding the wall and other things. There is certainly some things funded in the Omnibus Bill that I object to and for those reasons, I wish President Trump had not signed. However, I’m also noticing that some on the Left are beginning to modify their tones where Trump is concerned. Some within the mainstream media (MSM) are even saying Trump is now right about certain things. Who would’ve thought? I believe had Trump held his ground, refused to sign the Omnibus, he would’ve been absolutely vilified as a “dictator.” In fact, I firmly believe his signing the Omnibus has taken many Leftists up short. I think the Left in Congress was expecting Trump to veto it. There’s a possibility Congress might’ve overridden his veto, but in any case, the acrimony would have been ramped up to unbelievable levels. Trump took what he got and is literally running with it. And again, in six months, Congress will need to do something else because the Omnibus will have run its course. Had Trump not signed, these Democrats could’ve used that as part of their campaign slogan to get elected or re-elected. You’ll notice that President Trump also reminded everyone several times that there was virtually nothing in the Omnibus about DACA and repeated that he was willing to deal with it, but Democrats seem uninterested. This will play well come this November when Dems will have nothing to show regarding DACA. I have come to realize where all of this and Q is concerned is that this will take a good deal of time – all of it. It would be nice to see people arrested and behind bars. It would be nice to see all of Trump’s appointments confirmed by Senate. It would nice to already see a wall up and keeping illegal aliens out of the USA. It would be nice to see a lot of things, but in reality, the Left is not giving up easily nor will they. Much of the problems in America are due to the fact that Leftists (and I do mean actual MARXISTS), are doing everything they can to hamper any progress by Trump. They are fighting to maintain and to hang on and it looks absolutely desperate and pathetic. We are actually seeing shades of Hitler’s Nazism right before our eyes. The students of Parkland, FL just led a March for Our Lives protest in Washington, DC where the stated goal is “gun control.” Ultimately, what it appears these students want is an actual ban of guns and removal of the second amendment. What they fail to understand is that the second amendment does not grant me the right to keep and bear arms anymore than it grants me the right to protect myself or my family from an attempt to harm or kill. The second amendment recognizes my God-given right to protect myself and my property from criminals. It is the same with the first amendment as well. I already have the right to say whatever it is I want to say. I have the right to speak freely. Both the 1A and the 2A simply acknowledge these rights and both affirm that they shall not be infringed. The Left wants to infringe both of them. This is exactly what dictators have done in the past and interestingly enough, Adolf Hitler used teens and college students to get them to agree with him about turning in guns. He knew that once he had the young people, they would convince their parents. Eventually, all Germany bought the lie that the German government would keep them safe and they did not need their own guns to protect themselves. We know what happened. Once all guns were turned in, Hitler’s government/regime turned on the people and millions died. At the March for Our Lives protest, there were many speakers and many supporters. Even though David Hogg is being credit for “organizing” the march, the truth is that Hollywood producers along with big money from people like Oprah and others made that march happen. 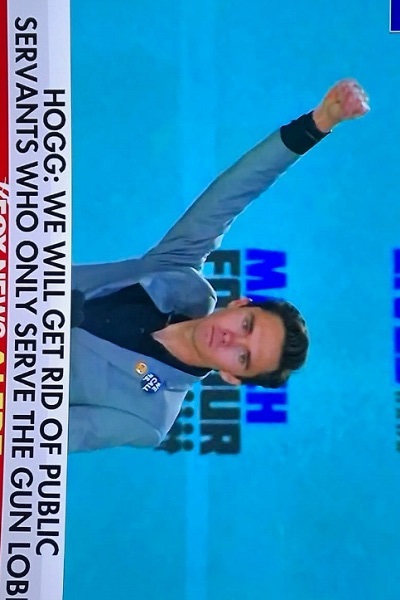 David Hogg is merely a pawn being used by very powerful people. Interestingly enough though, after he completed his speech, he gave what can only appear to be the closet thing to a Nazi salute, except with a closed fist. This poor kid is so enamored with the fame, the adulation and being treated like a rock star, he has no idea the extent that he is being used. As far as he is concerned, he’s a VIP whose time has come and he is taking advantage of it. Someone pointed out that the suit he is wearing in that picture is very expensive. Let’s not even talk about who is paying for this kid and others like him to travel all over preaching their hatred, divisiveness, and with complete lack of facts. This is what the Left does and they have a great deal to lose if they in fact, lose. I believe they will lose because I don’t think God would’ve allowed Trump to win unless He was providing a last chance for America. Ultimately, I know what the Bible states about the coming one-world order. In the meantime though, there could be a bit of a respite or reset, if you will. It may only last until the next president is elected, so we need to make the best use of our time. There is going to be some rough surf ahead. It won’t be clean. It may appear at times that President Trump is fighting a losing battle, but I think ultimately, God’s will is going to be accomplished. The whole thing is a bit ethereal to me. It just seems weird. The Left almost gained full control over the United States and now they are fighting back viciously and with every fiber of strength they possess. Let’s hope and pray that we have not misunderstood God’s intentions in this whole thing. Entry filed under: 9/11, Agenda 21, Atheism and religion, christianity, Communism, Council on Foreign Relations (CFR), Cultural Marxism, Demonic, devil worship, Emotional virtue, eternity, Global Elite, Gun Control, Political Correctness, Politically Correct, Politics, Religious - Christian - End Times, Religious - Christian - Prophecy, Religious - Christian - Theology. Tags: federal reserve, first amendment, omnibus, president trump, second amendment. Yesterday I saw a few video’s with Kay Griggs being interviewed! What she told was so awfull and evil. She said there is a militairy intel group The Joint. They control everything. My point is, the evil is so widespread, across the world. They would not allow Trump if they could not use them!!! I hope I’m wrong, but like you said before; How does this fit with Bible prophecy? Interesting. I’ve not heard of Griggs but I’ll try to do some research. That Intel group I’ve not heard of either. Q dropped a number of huge crumbs this morning and I’ll try to research that and possibly do a write-up as time permits. Offhand, as far as Bible prophecy goes, even if we get this huge respite with Trump, ultimately there will be a one-world govt headed up by AntiChrist. I know there are those who disagree with that assessment but it appears to be plainly taught in Scripture. As Dara as all the many steps that get us from here to there, not really sure.